Prominent & Leading Manufacturer from Nashik, we offer flat board and kraft paper flat board. comparing be provided as per requirement. Our product is more compared to a wooden product. Edge Guard It is used to protect corners of all kind of round shaped material while stacked on the pallet. The edge guard protects the material while they are strapped with steel or nylon. The material is safely guarded with Edge Guard as the product do not move and the pallet gets good strength. 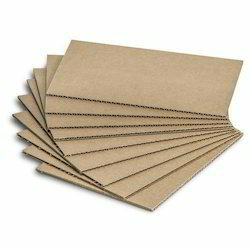 We are one of the generally acclaimed makers, suppliers and exporters of Kraft Paper Flat Board. The offered level board are produced using recyclable material, for supplanting the well used out chip sheets and hard sheets. Our made level board is usually utilized as a transitional spacer between the sensitive surfaces and sheets. The supplied level board is loved for its unmatched quality and strength. Our sent out level board is known to give rigidity and backing to the bundling boxes. Looking for Flat Board ?